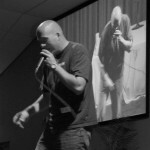 Gavin (vicar of Uplyme) is beatboxing at Lyme Regis youth cafe (Insparation Cafe) Friday evening at 7pm. This is for any young people aged 11-18. Then on Saturday, at some point between 2pm and 5pm he is beatboxing at the Axmouth Village Show! Is this the same chap who beat Hugh FW with his crudites??! !